Located right opposite Coolangatta Beach, Blue C Coolangatta offers individually decorated apartment accommodation just minutes from the Gold Coast Airport. Boasting stunning ocean views, the resort is home to a great range of onsite facilities and is also within walking distance of Greenmount and Kirra beaches. Conveniently close to local shopping, dining, entertainment, activities and attractions, the resort is also just 30 minutes from Surfers Paradise and the popular Gold Coast theme parks. Situated on beautiful Goodwin Park, Bombora Resort offers comfortable accommodation and a convenient range of onsite facilities within walking distance of Coolangatta’s best shopping and most beautiful beaches. Surrounded by quiet leafy grounds, the resort is just 5 minutes by car from the Gold Coast Airport and a 10 minute drive from Currumbin Wildlife Sanctuary and Coolangatta Tweed Heads Golf Club. Just a short stroll from famous Griffith Street, the resort enjoys shopping, dining, activities and attractions right on its doorstep. Nestled on the picturesque headland between Coolangatta and Rainbow Bay, Greenmount Beach Resort offers well-appointed accommodation ideal for couples and families. Boasting stunning coastal views, the resort is home to a great range of onsite facilities and is conveniently close to local shopping, dining and entertainment as well as being just minutes from activities and attractions such as Coolangatta Beach, Kirra Beach, Fingal Lighthouse and Snapper Rocks. Located on the beachfront of Coolangatta, Mantra Coolangatta Beach offers self contained accommodation overlooking Rainbow Bay, Kirra and Greenmount. Enjoy a great range of onsite facilities, the resort is conveniently located close to a range of shopping, dining, activities and attractions. Located right next door to the dining and entertainment venue of the Twin Towns Services Club, Mantra Twin Towns, Hotel & Apartments offers luxury accommodation and full resort facilities. Enjoying the best of both worlds, the resort is located between the towns of Tweed Heads and Coolangatta on the New South Wales and Queensland border. Offering luxury beachfront accommodation just minutes from the airport, Oaks Calypso Plaza also enjoys an outstanding range of family-friendly onsite facilities including children's pool with waterslides. The resort is also conveniently located close to a range of local boutiques, bars and restaurants, beaches and Coolangatta attractions. 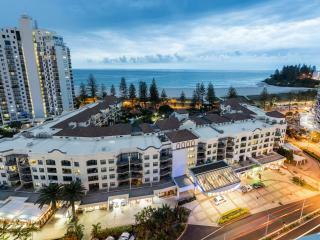 Located in the heart of Coolangatta overlooking the beach, Ocean Plaza Resort offers individually owned and decorated apartment accommodation with stunning ocean views. Home to an excellent range of onsite facilities, the high rise resort is a landmark in the Coolangatta skyline and is close to a popular range of local shopping, dining, activities and attractions. A family friendly resort, Ocean Plaza is also ideal for those who wish to enjoy an extended holiday with all the comforts of home. Located at the southern end of the Gold Coast, Points North Apartments offers self-catering apartment accommodation with easy access to the beach and open parklands. Just 5 kilometres from the Gold Coast Airport, the resort is home to a great range of onsite facilities and is within walking distance of a variety of local shopping, dining, entertainment, activities and attractions. The resort is also just a short drive from a wide variety of popular Gold Coast attractions including the famous theme parks. Situated on the waterfront of Greenmount Beach, Reflections Coolangatta Beach offers self contained individually furnished apartment accommodation overlooking the Pacific Ocean and Coolangatta Beach. Home to a great range of onsite facilities, the resort is part of a prestigious complex offering plenty of peace and quiet away from the crowds while still being conveniently close to a range of local shopping, dining, activities and attractions.